PUMAS PLEDGE GOING ON NOW! Do you like gift wrap and cookie dough fundraisers? Neither do we! All gifts made during our Pumas Pledge go directly to our PTO -- no middleman, and no extra work! Ask your friends and family to make a small donation in your student's name to help all of our educational activities, field trips and community building events. If we raise $80 per child, we'll meet our goal for the year! The Pumas Pledge is one of only two major fundraisers we have planned for the year, because we believe in focusing on school and fun -- not fundraising! Our second fundraiser is a Mother's Day Orchids Fundraiser in May. We encourage all families to participate, and gifts of $1 - $100 or more are welcome! Classes with 80% participation get a popsicle party! Students with 100% participation get a party and an extra recess!! We're now accepting nominations for Vice President and Treasurer! Officers serve for two years and help us plan and execute our events, manage our fundraising efforts, and guide enrichment experiences for our students. ​Vice President The vice president shall act in the absence of the president. The vice president is the liaison between the chairperson of a committee and the executive board. Treasurer The treasurer keeps current and accurate accounts of the business transactions of the PTO. ​Submit your nomination now! Voting takes place at our next meeting on May 11 from 5:30-6:30pm. Tuesday, March 21 from 5-7pm - Free admission and activities! 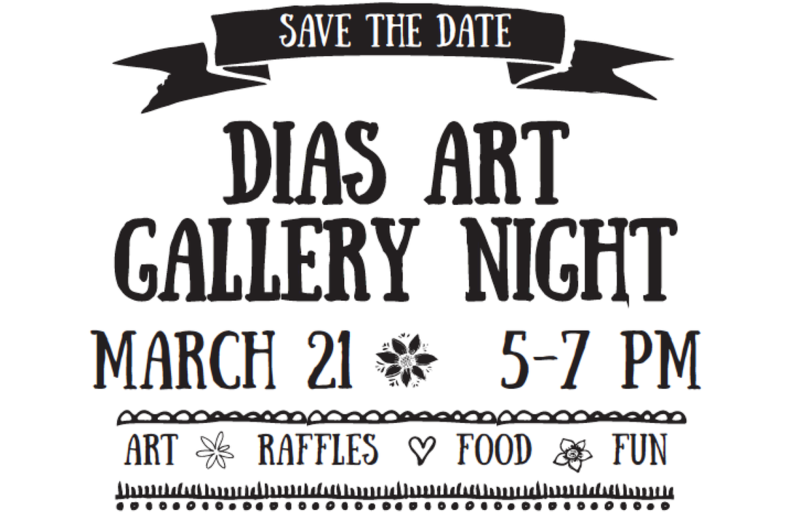 Our kids are hard at work on individual and group class art projects and are eager to show them off at our second annual DIAS Art Gallery Night. We’ll have pizza and hot dogs for sale, raffles, a silent auction, and interactive parent and child activities. Raffle items needed from parents and our community! We need new, unused art-related items (pens, art books, coloring books, colored pencils, paints, molding clay, craft items, etc). If you have items to donate, please bring them to the front office by Friday, March 17. Look for volunteer sign-up information soon! 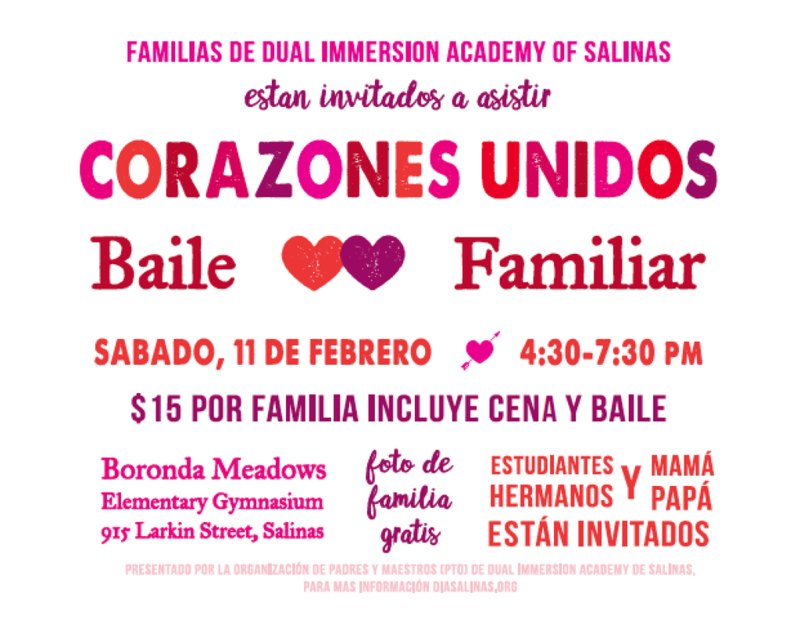 DIAS families (students, parent/guardians and siblings) are invited! ​Sorry, this event is not open to the public. Join us for an informational meeting at DIAS, 1114 Fontes Lane, at 6pm on Tuesday, February 21. Childcare is available. See flyer for details. 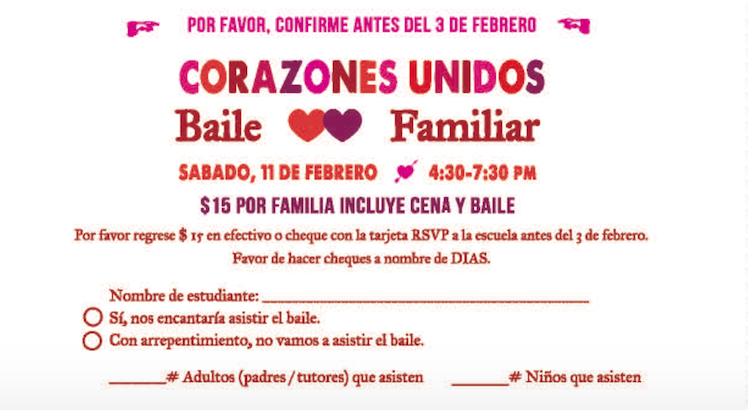 DIAS FAMILIES ARE INVITED: CORAZONES UNIDOS FAMILY DANCE! 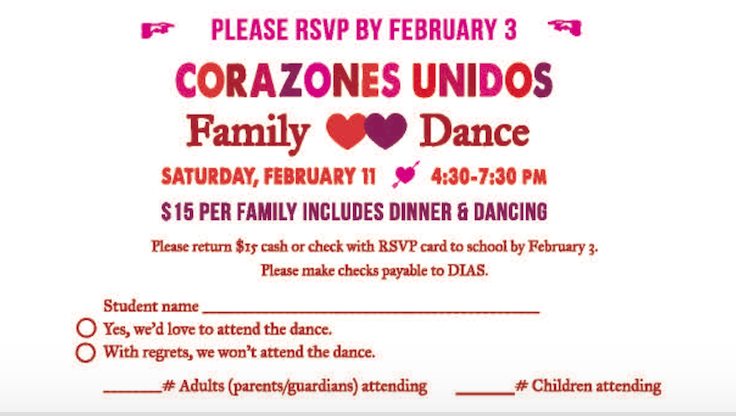 DIAS Families: You are invited to attend "Corazones Unidos" our DIAS Family Dance on Saturday, 2/11. 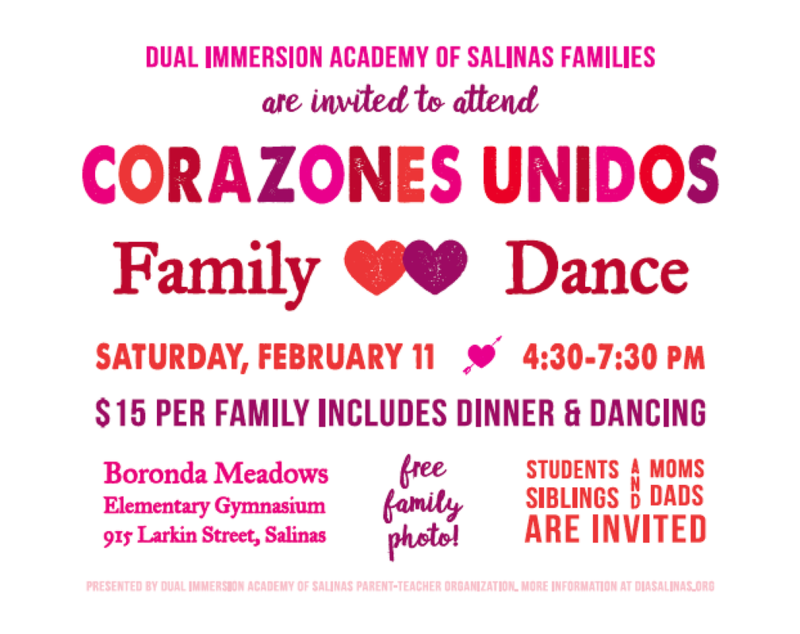 Invites went home last week and RSVPs and $15 per family (parents/guardians and children) are due back this Friday, 2/3. Tickets include a pasta dinner, DJ and dancing and a family photo! Can't wait! PUMAS PLEDGE DRIVE A SUCCESS! ​Excited to announce that our first-ever Pumas Pledge Fundraiser was a great success. Thanks to the support of our DIAS families, we raised more than $4,500 — and met half of our fundraising goals for the year! Great job everyone! DIA DE LOS MUERTOS A GREAT EVENT! 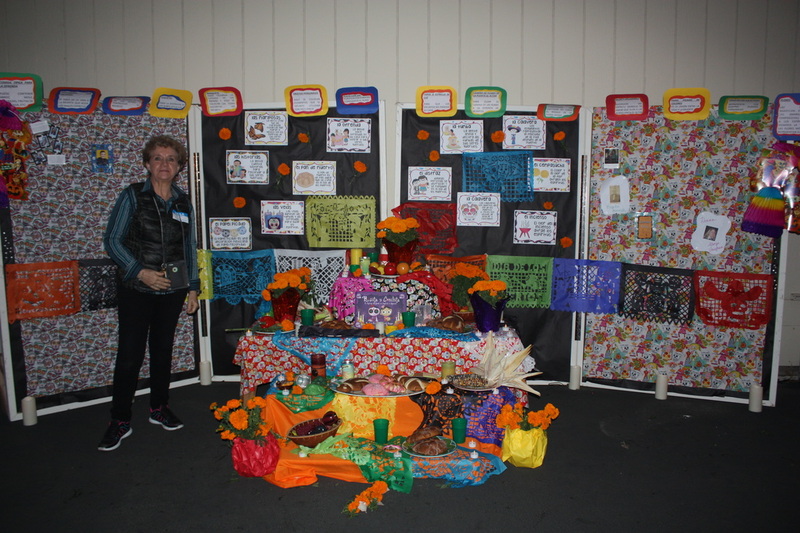 Thank you to all the families who volunteered and participated in our Dia de los Muertos celebration. What a fun night! 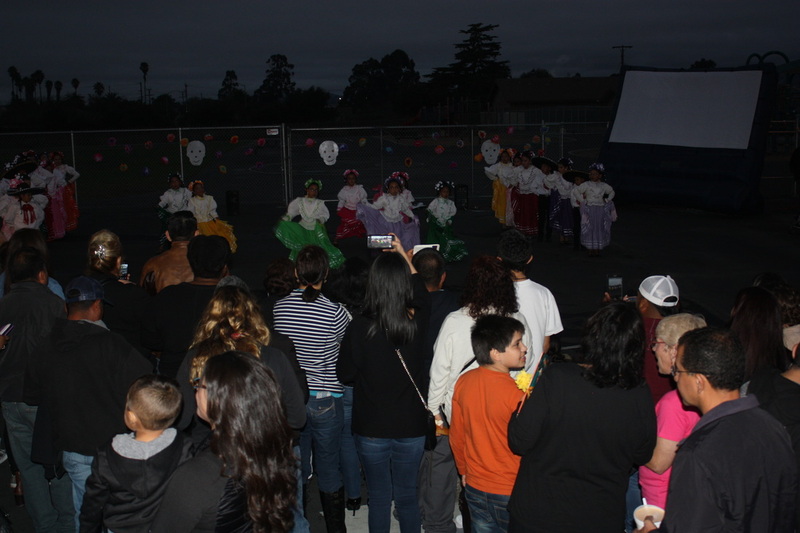 A special thanks to DIAS parents Nicole Fowler, Hillary Fish and Dina Urquizo for leading the event committee, Principal Mary Pritchard for the delicious pozole, tamales, decorations, guidance and much more, Grupo Folklórico Citlalolín, Mr. Santos' Salinas High School's AP Honors Spanish class for the amazing Dia de los Muertos displays, and to Everett Alvarez High School student volunteers for helping support this great event. Go to http://www.diasalinas.org/pto-meeting-minutes.html to read or download our PTO meeting minutes from October 13. Next meeting is Thursday, November 10 from 5:30-6:30pm. DIAS Parents: Are you bilingual? Can you speak, read and write well in English and Spanish? Are you comfortable translating from English to Spanish? Would you like to participate and volunteer your time for our school? If you answered “yes” to all of the above, please consider joining our DIAS Parent-Teacher Organization translation committee! Tasks include translating PTO meeting notes, agendas, correspondence and/or attending PTO meetings (every second Thursday of the month from 5:30-6:30pm) to help translate. Please email us at diaspto@gmail.com for more information or to sign up! A positive learning environment at home has a powerful impact on how well students do in school. Our goal is to help give you the tools to help your child succeed and we encourage all of our families to get involved with our school. We'd love as many parents as possible to be involved and build partnerships with families so we can promote high student achievement. Check out our website at www.diasalinas.org for comprehensive info about our school and the 2016-2017 school year. We update our website frequently, so check back often. "Like" us on Facebook and subscribe to our events for push notifications. Sign up for our newsletter on our website for the latest news and upcoming event info. Please feel free to email us if you have any questions or feedback. Download our PTO Welcome Packet. 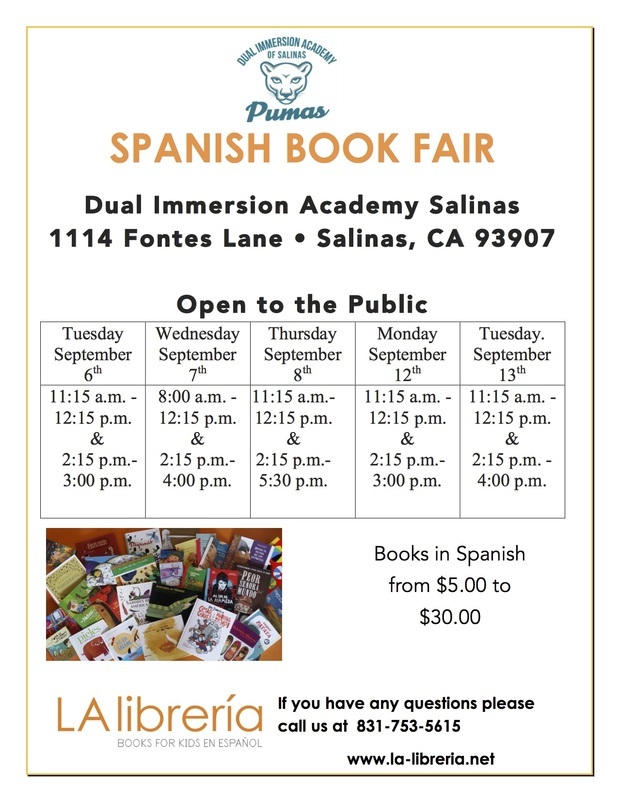 Join us Sept 6-13 for a Spanish Book Fair at DIAS! Open to the public - so please tell your friends! Books in Spanish from $5-$30. What is the Pumas Pledge? DIAS PTO supports many of the school’s field trips, community-building events and learning experiences. Unlike some fundraisers where a large portion (typically more than half) of your money goes to an outside company, 100% of your pledge goes to the school! Where does my money go, and what does my child get from the PTO? Please make a pledge by filling out the attached form and including a check, made out to DIAS PTO, or cash. You can also go online to website to make a donation and pay with a credit card. 100% participation! If each DIAS family raises $50 for our Pumas Pledge, we will reach more than half of our fundraising needs for the entire school year. We encourage all families to take part in volunteering and fundraising efforts. Every donation, large or small, adds up to make a big difference. If you have any questions, please email us at diaspto@gmail.com. A reminder we have Back to School Night on Tuesday, August 30 from 5:30-6:30pm. There will be two classroom sessions (5:40-6pm and 6:05-6:25pm) for parents with multiple children. Please stop by the cafeteria to learn more about our PTO, our staff and upcoming events. This is a parents-only event, no childcare is available. We will also have a meeting at 6:30pm in the cafeteria for the parents of English learners. Follow us on Facebook and visit our website for more info! Do you have a question for your student's teacher? Is your student having breakfast or lunch in our cafeteria? Kids do better in school if they eat a nutritious breakfast and lunch. Both are available from the district’s food service program. Find out more about on our Breakfast & Lunch page. 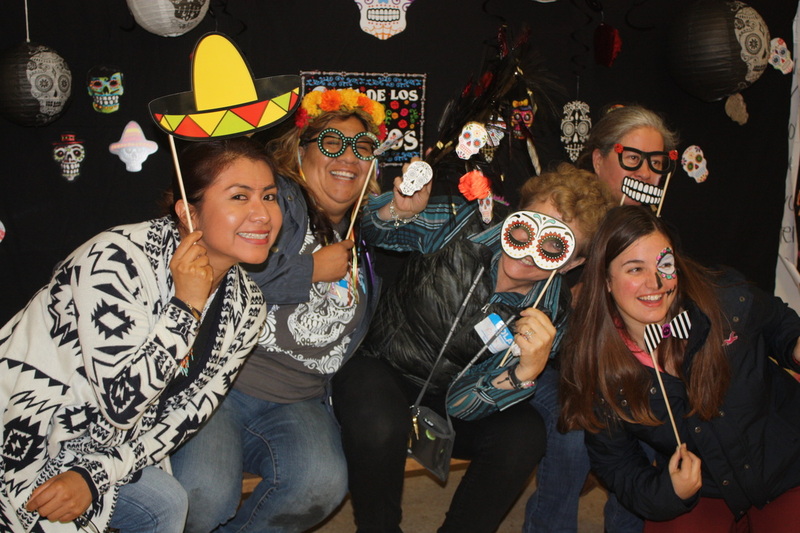 At DIAS, we have an active Parent-Teacher Organization (PTO) that's focused on providing extraordinary learning experiences for our students and building a community for our families. 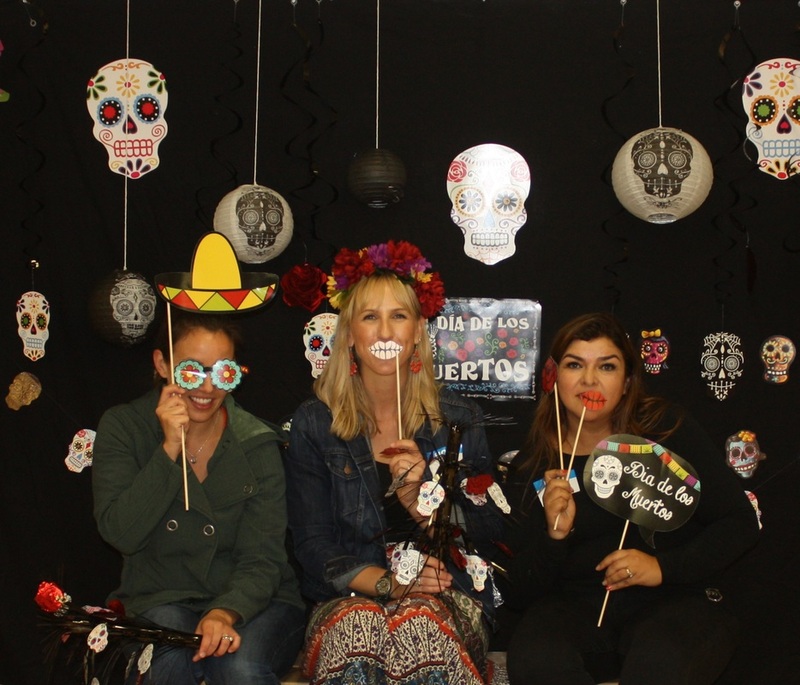 Our next PTO meeting is Wednesday, August 24 from 4:45 - 5:45 p.m . We'll be discussing our fall fundraiser and Dia de los Muertos. We'll also decide on meeting days and times for the year. If you have input and can't make our meeting, please fill out our contact form so we have your feedback. Daycare is available. 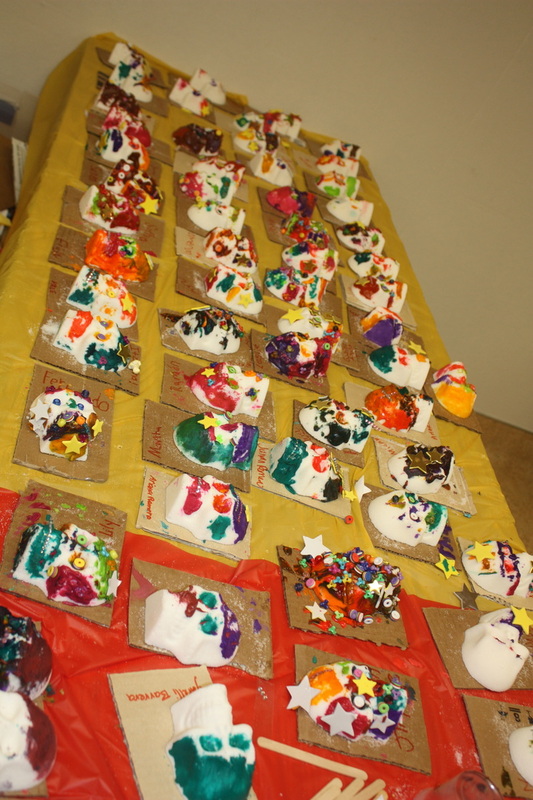 Read our minutes from previous PTO meetings here. Where did the summer go? School starts Wednesday, August 10. Please visit our Schedule and Calendar pages for all the info you need to know. Preschool parents, please note school is over at 11:15, not 11:25. All school supplies are provided, so no need to pack any pencils or paper. Also, on the first day of school we're hosting a "Back to School Celebration" in the cafeteria. Meet us after you drop the kid(s) off for pastries and coffee, plus a back to school discussion with Principal Mary Pritchard. 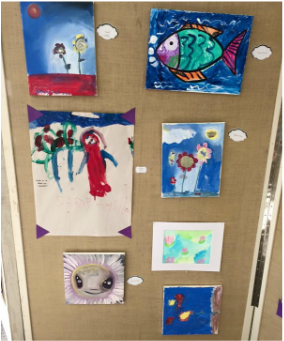 Art Gallery Event Night a success! 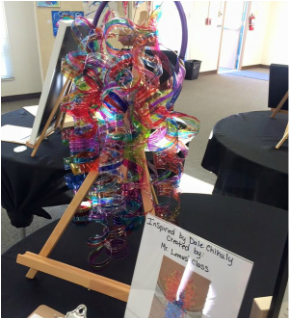 We raised nearly $1,000 with our raffles and silent auctions, and had a ton of fun! Thanks to everyone who helped support this great event. Bringing you school news, announcements and event information! 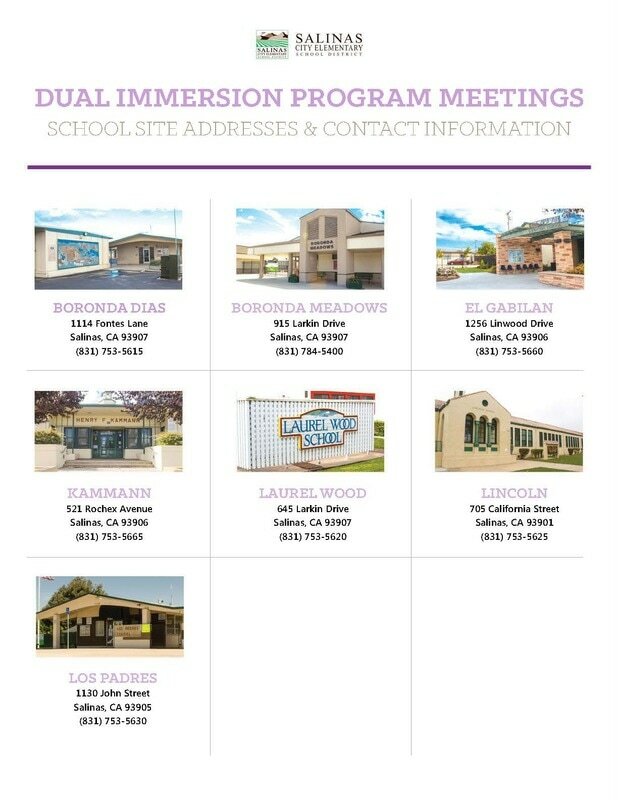 The Dual Immersion Academy of Salinas opened in fall 2015 with two kindergarten classes and the school is adding dual immersion classes every year through 2021-2022 to become a TK-6 program. Offering the district's only 90:10 Spanish dual immersion transitional kindergarten (TK). Open to students turning 5 between September 2-December 2 of the school year. Smart Start is a full 100% Spanish immersion preschool offered to 3- to 5- year-old children (no Spanish background required). An affordable on-site before- and after-school day care is available to all TK+ students. Bringing you school news, announcements, event information, and more! 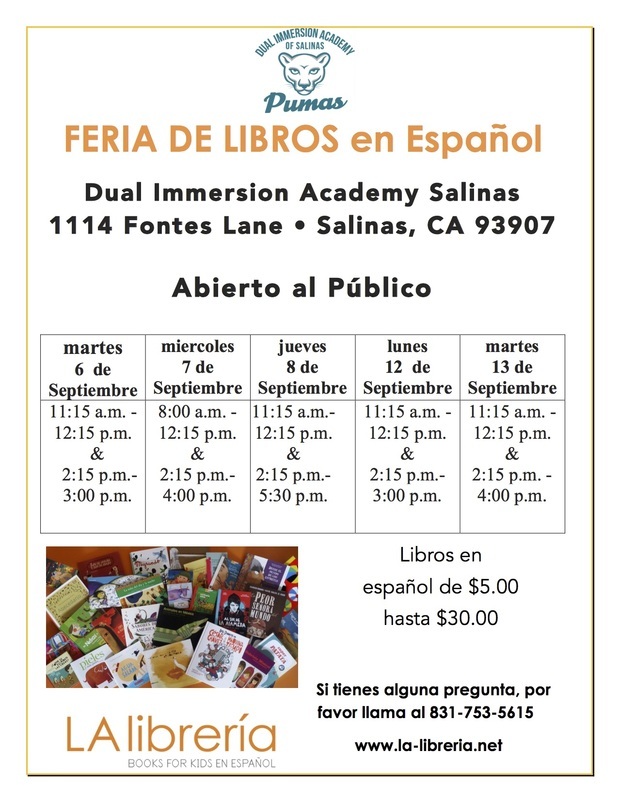 © 2015-2019 Dual Immersion Academy of Salinas Parent-Teacher Organization. Website created with permission from the Salinas City Elementary Unified School District. 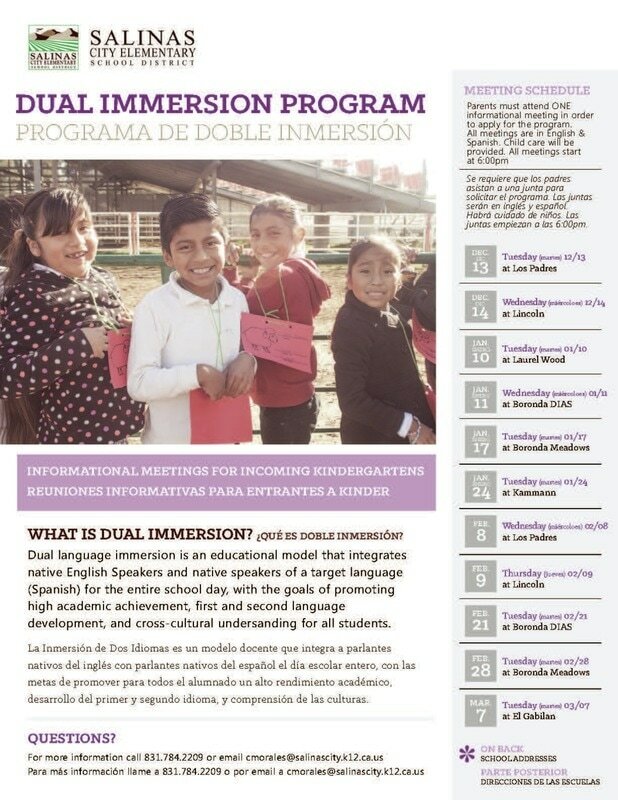 Learn more about the benefits of dual language immersion from Dual Language Program Advocates.